Burger, meet your new BFF: crab salad. I’ve been seeing variations on a “sushi” burger for awhile now on the Internets and had passed it off as a too-decadent (expensive) dinner for a weeknight. Well, no more. The Asian flavors and crabby sweetness of this salad were a nice addition to what would otherwise just be yet another basic burger/dinner staple ’round these parts. I see this simple salad in my (distant) future for many hot summer nights – kicked up with some cool celery and spooned over some sort of crunch – a plantain chip, shattery tortilla or nut cracker would be delightful here. This recipe serves 2 for dinner or 1 for dinner + 1 for lunch. For a side, some broccoli slaw would be fantastic here; but I wasn’t starving to death, so I served on its own. Combine everything but the mayo in a bowl or jar – I use the container that came with my immersion blender. Whiz with the immersion blender, adding oil in a steady stream until everything comes together and thickens up. Mix until combined, adding aioli until your desired cohesiveness is reached. Stash in the fridge for half an hour or so to give the flavors a chance to meet and mingle. Form ground beef into 2-4 burger patties. Salt & pepper both sides. Cook 3-4 minutes per side in a large pan over medium-high heat. While the burgers are working, slice avocado and set aside. 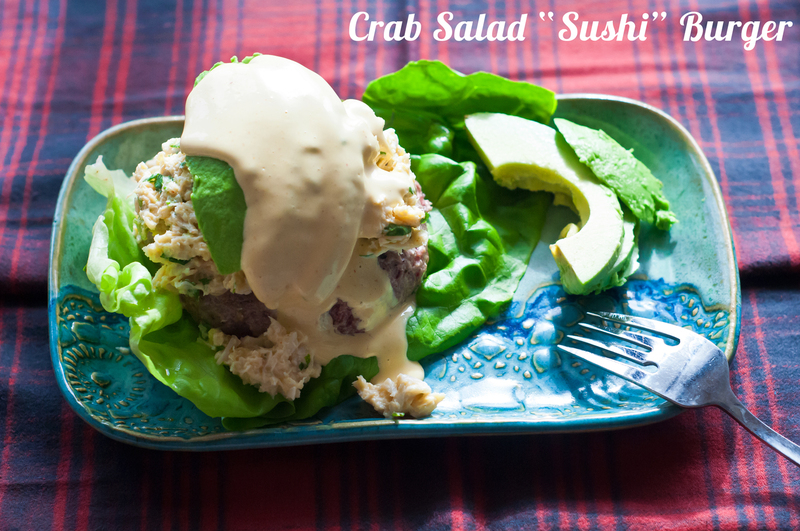 When the burgers are finished, top with generous spoonfuls crab salad + sliced avocado + more aioli and go to town. Serves 2 for dinner if you want big burgers; 4 if you want quarter pounders. Yum !!! Thank you for sharing.